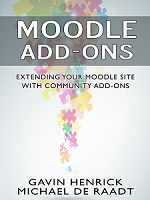 As some of you know, I have been spending some time co-authoring a Packt Publishing book on Moodle with Jason Cole and Jeanne Cole. The book is called “Moodle for Business” and focuses on use cases within organisations for which Moodle can and is used globally. Each chapter also features at least one case study of an organisation using Moodle for the specific use case. But enough about that for now. Now that we have moved into the production phase of that (gone through the writing, and main editing phase), it has given me a bit of time to start doing something which I have wanted to for a while, and that is look at the available Moodle 2 modules and the state of the release. As you may be aware, there are plans of updating the Modules and plugins database which is a good thing. Right now, if you search for plugins with a requirement of Moodle 2.0 or later you get just 13 modules, which i list below. However, as you will see there are known Moodle 2.0 compatible plugins not on this list as they are stored under “Moodle 1.9 or later” rather than Moodle 2.0. So to get a full list will take some effort, and not for this post. I have not started installing, or reviewing any of the below, so dont take this list as a recommendation. But that is what I intend to start doing in coming weeks. What type of review am I going to do? They are just 3 questions you need to ask about any module, but I will focus on the basic questions!. So thats it for now, just a post to say what I intend to start doing over the coming weeks. Implements activities like live video consultations, presentations, seminars. This block allows the user to create CSS (or a theme) though a simple point and click interface and WYSIWYG css editor. Standard is a tool for creating and editing slideshows using the Simple Standards-based Slideshow System (s5). Thanks for the reminder. I will be adding in a new review of a module every day, so will be sure to include yours during the process. Keep up the great work with the mods, I know that many will end up using that Navigation buttons one!